Software and Training that solves one of the biggest problems affiliate marketers have...getting sales! There really is not many CONs but more affiliate and WP training would be good SO I have added in some Great Bonuses Including My OWN best Selling training (Which is on a limited time offer, after the launch it is being taken down)! Scroll to the bottom to see for yourself! WP Affiliate Rush Review – Bringing Software and Training Together to boost sales, Lets see If it Works! Hello my Readers and Friends, In this WP Affiliate Rush Review you will take you through what you get and talk about if it is worth your time or not! Firstly the WordPress plugin is only a part of WP Affiliate Rush, a powerful part but still only a part of the product. WP Affiliate Rush also has good solid detailed training on how to get set up and start making sales. The WP Affiliate Rush Plugin just really helps you to increase sales using a method that I have never seen used before. Before we look at the training I want to talk about the WP Affiliate Rush Plugin, what it does is actually very clever and something that I may start adding to my reviews. Everyone knows that bonuses are now a very important part of affiliate marketing. I use bonuses on this site to try to help fill any gaps in the training that I find or just have them to help increase the knowledge of the subject that people are buying. I believe that bonuses do help but if you are really serious about the product that you are buying you should not be looking for the post or review that has 1000 bonuses because there is no way that you will ever get anything done by going through 1000 random bonuses. So what the WP Affiliate Rush software does is allow you to add a line of code into your review and it will count down how many bonuses that you have. You of course can change and choose how many bonuses that you want to give away but I would recommend only making it look like a small amount are still available as this pushes people to make the decision right away. In the members area of WP Affiliate Rush there are 3 main steps. Firstly watch what the WP Affiliate Rush Plugin does and how to install and use it. Next you can download it and install on your WP site. 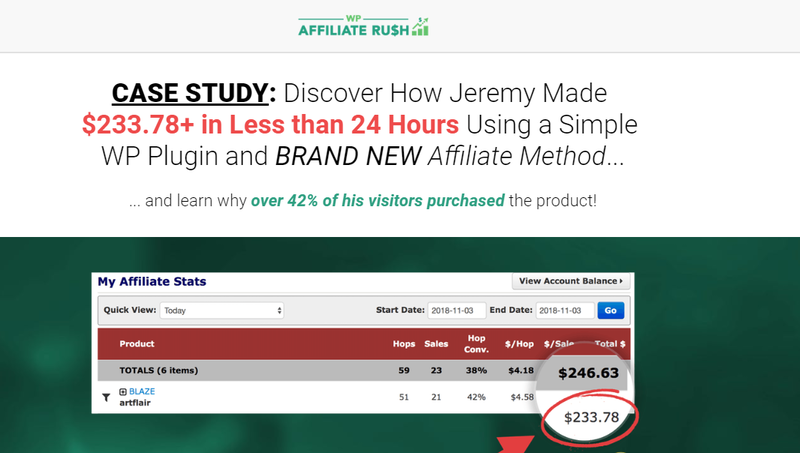 Then there is a case study of when Jeremy uses the WP Affiliate Rush Plugin which is useful to see how it increases sales and conversations….which it really does! Then there is a 46 Minute training video that shows you the best way to start and build up your affiliate business. I like Jeremy’s open and to the point training in WP Affiliate Rush, though because the video is 46 minutes you may want to pause and take a few notes before continuing. My WP Affiliate Rush review is a bit shorter today but only because the method is simple and to the point and is proven to work. Without using a Plugin or software I have increased sales by using scarcity in my bonuses recently. All that I did was write that certain bonuses would be gone after the launch was over. The first time it increased conversations a bit. The second time it increased my conversations a LOT because I did actually remove the certain bonuses…so people knew that I was not joking or just saying it to get them to buy! So my point is that this does work and with the WP Affiliate Rush Plugin it will make getting more sales and more conversions a LOT easier! Last thing to say about WP Affiliate Rush is that it is great for beginners because of the solid training and great for people who just want to increase their conversations and sales! Now lets have a look at the OTO’s or Upsells! OTO 1 of WP Affiliate Rush is an extra set of case studies and a Full Done for you Pack! OTO 2 of WP Affiliate Rush is Super Affiliate Training + Live Call + Mastermind! OTO 3 of WP Affiliate Rush is Resell Rights! YOU WILL GET ALL THE BONUSES BELOW WHEN YOU BUY THROUGH MY SITES EXCLUSIVE LINKS! Grab The Bonuses Above To Get a Huge Head Start With This New Product – CLICK HERE NOW!